“Any student who competes in a case competition, whether successful or not, is ready to face the complexities of the marketplace locally, nationally, and globally,” says Jennifer McCleary, Director, Student Experience. ​DeGroote BCom students are gaining an impressive reputation for success by competing in and hosting a number of case competitions throughout the school year. That reputation was enhanced by a pair of strong showings in recent months. In February, Marla Wojnicki won first prize in the Ryerson Marketing Competition while working with a team of Ryerson students. ​Wojnicki says she enjoys competing in case competitions because they provide her with the opportunity to step outside of her comfort zone and gain experience solving real-world business problems. In March, DeGroote students Blerina Ago, Arabela Turujila, Shahzeb Siddiqi, and Noor Zia took home second place in the Western Canadian Business Competition. 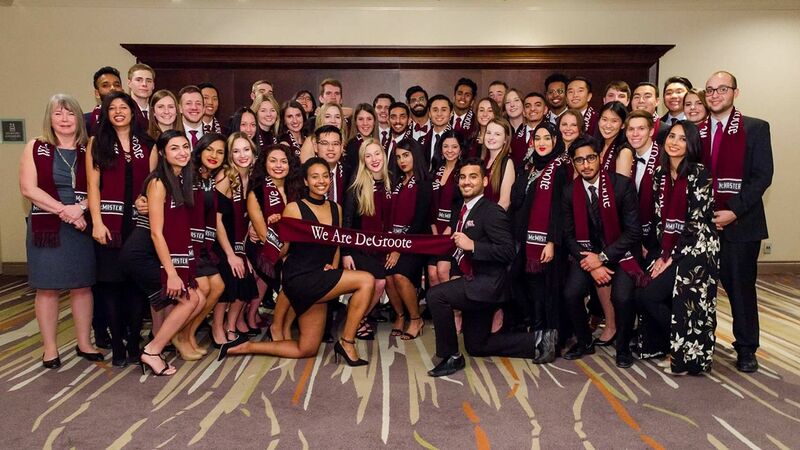 ​McCleary attributes the ongoing success of DeGroote undergraduate students to the values of integrity, leadership, and innovation fostered within the School. She also cites a genuine interest in applying what they’ve learned in class to real-world scenarios. “Case competitions provide students with a unique opportunity to experience not only the thrill of competition, but what to expect when they graduate from DeGroote and enter the workforce,” McCleary explains. “These competitions allow all of the knowledge gained in the classroom to be applied, and not solely to one specific topic. Beyond internship and co-op opportunities, I can’t think of a better way to gain practical experience on what it’s like to tackle real-world business issues,” she continues. In addition to attending case competitions hosted by schools across Canada and beyond, DeGroote students and faculty also coordinate several of their own. ​The DeGroote Human Resources Association (DHRA) and the DeGroote Finance Association (DFA) are student clubs that hosted their own competitions in March. Krista Henshaw, DHRA Second Year Representative, says the purpose of the DHRA event is to challenge younger students to help them feel more comfortable competing in larger competitions as upper-year students. The DHRA and DFA welcomed 10 and 25 participants to their events, respectively. ​The DeGroote Marketing Association (DMA), DeGroote Accounting Association (DAA), and the DeGroote Business Challenge (DBC) are three other clubs that also plan annual competitions. ​Faculty are also actively involved in the success of undergraduate students at case competitions. The DBC recruits professors to judge their annual challenge, and faculty are often invited to provide feedback to participants. Sarah Mohammed, Co-Chair of this year’s team at DeGroote, describes the training period as very intense. During first semester, each academic team completes a case study and conducts a 20 minute presentation every week. The debate team practices dissecting controversial topics during their training period. The social team is charged with bringing the spirit throughout the competition, while the sports team develops plays to outsmart other schools. Many students that compete in these events notice their skills improving with each competition. ​Wojnicki, fresh from her win at the Ryerson Marketing Competition, has three pieces of advice for any student interested in doing well in a case competition: Don’t be afraid of revealing your passions to judges, stay up to date on industry trends, and of course, be confident during your presentation. Want to learn more about case competitions? DeGroote BCom students who wish to compete are encouraged to read the BCom Bulletin, follow DeGroote and the DCS on social media, reach out to student clubs for information about their events, and speak with faculty members about upcoming opportunities.